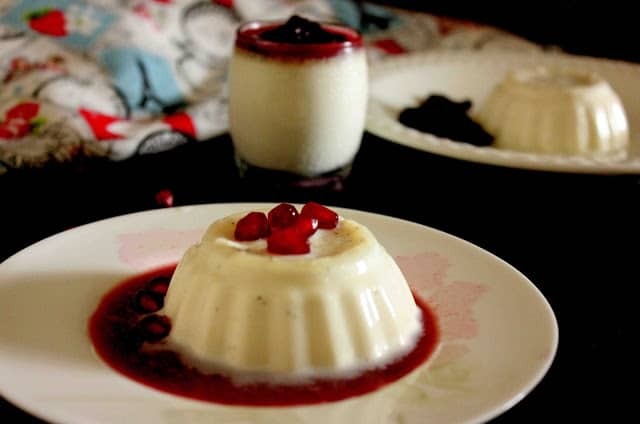 Panna Cotta , an Italian dessert which literally means cooked cream.Usually it’s served with fresh fruit compote or wild berries.The best part is that such delicious dish can be made so quickly with few ingredients in hand. Today i will discuss about the basic version of this dessert ,classic vanilla panna cotta with a hint of vanilla bean. I love to use vanilla bean instead of the vanilla essence. I have used gelatin here which can be replaced with a veg option of agar-agar. A perfect panna cotta should have just enough gelatin that it seems the cream is barely holding together.A little more gelatine can steal away the charm of the dessert resulting a stiff one. One more thing i want to make clear about the use of milk and cream in this dish.Well you can use almond milk,soya milk or any milk and cream combination.The fat content in Heavy cream is 36 percent, half-and-half is 12 percent and whole milk is 3.25 percent.Less fat will result in a softer panna cota and it may break when you unmould unless the quantity of gelatin was increased. Well before sharing the recipe with you all ,let me share some pics of Humayun Tomb, the tomb of the Mughal Emperor Humayun in Delhi, India. Inspired by Taj-mahal, it’s built by a wife for her husband. Bega Begumbuilt it after nine years of Humayun’s death. It was Navaratri time when i visited this place with my husband and sister.The beautiful monument is a great example of Mughal architecture by a persian Architect. In a heavy saucepan take the milk and warm it.Take care it should not boil.Dissolve the gelatin in it.Stir the sugar into the milk and continue warming until it dissolves as well. It shouldn't take more than 5 minutes total to dissolve both the gelatin and sugar. Again, never let the mixture boil. When completely dissolved,take it from the stove.Now take a drop on your finger and check whether there is any distinct grains of gelatin or sugar.If yes, than again put back on stove at low heat and dissolve completely.When done remove from stove and whisk the cream and splited vanilla pod.Let it stand for 5 minute . In the mean time Spray the ramekins with cooking spray, then use a paper towel to wipe out most of the oil. Pour the liquid in the prepared ramekins and set it in refrigerator for at least 4 hour.If keeping longer than cover each mold lightly with cling wrap. Once chilled ,unmould it on your serving plate.Dip the bottom part of ramekin for 2 sec in a bowl of hot tap water, and then carefully invert onto a serving plate. Serve with fresh fruit compote of your choice or simple enjoy as it is.